Jon Jones’ lousy 2016 seems to be turning around just in time for a little holiday redemption. After very nearly ruining UFC 200 with a failed out-of-competition drug test and then suffering the indignity of an independent arbitration that resulted in a one year ban from MMA, Jones would have been forgiven if he just turned his back on 2016, locked himself in his room, and hung a sign on the door that read, Do not open until New Year’s. But to his credit the former UFC light-heavyweight champion and Man Perpetually at War With Himself took his punishment like an adult, shook off his shame, and got back on the one horse that was available to him, fighting (and beating) former Olympic wrestler Dan Henderson in a grappling-only match at Submission Underground 2 on Dec. 11. In doing so, Jones not only reclaimed the narrative of his chaotic public life, he also kicked off a small cottage industry of fighters suddenly eager to call him out. First came a request from former UFC middleweight champion Luke Rockhold, who tweeted out the day after Jones’ match that Jones should “let these old men be” and grapple with Rockhold at the end of January. This call-out made some sense. Like Jones, Rockhold is currently on the MMA shelf, though his prohibition stems from a leg injury rather than the ingestion of outlawed substances. And Rockhold is a big middleweight, which would make him a small light-heavyweight, so fighting Jones wouldn’t be outside the realm of reason. Of course, Jones is an enormous light-heavyweight, with arms and legs that stretch to infinity, but in a grappling match, free from the fear of kicks and punches, no one could fault Rockhold for hoping. Besides, a fighter can only sit on the sidelines for so long before he starts to go mad. Rockhold hasn’t fought since losing his title to Michael Bisping by knockout six months ago, an eternity in the life of a fighter desperate for redemption, or at least a little action. Luke Rockhold may have been the first but he would be far from the last. After Jones tweeted that he was looking for an opponent for the next Submission Underground event, it’s as if a great door had been thrown open and every grappler with a name felt free to come rushing in. Volatile Brazilian jiu jitsu black belt, Conor McGregor training partner, and potential MMA debutante Dillon Danis implied on Twitter that he would fight Jones if the UFC fighter begged him. Leg-lock specialist Garry Tonon said he’d be happy to take part in a “bjj superfight” with Jones. Vinny Magalhaes, a grappling genius-turned-passable-mixed martial artist, volunteered, as did former Strikeforce middleweight champion Jake Shields, whose MMA career was proof, for a little while anyway, that a strictly BJJ-based style could still triumph in cage-fighting. 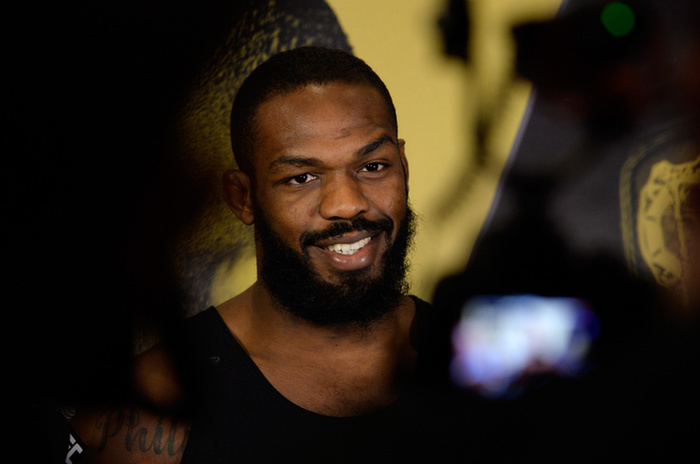 That’s not a sentiment you hear very often: that it would be “fun” to fight Jon Jones. Most people who have had to take on the pound-for-pound great over the last five years have approached the task as either a grim responsibility or a nearly insurmountable challenge, a test of their fortitude and courage. There’s always been a sense that fighting Jones is something that must be done for the sake of one’s manhood: a great contest with one’s own soul. But it’s never been described as something fun. But I suppose the prospect of fighting Jones becomes much more appealing when his most terrifying weapons have been taken from him. No doubt Jones is a formidable grappler but take away his ridiculous long punches and cruel stabbing kicks to the knee, strip him of his spinning elbow attacks and his fearsome ground-and-pound and suddenly he’s just another man. Absurdly strong and large and lanky and crafty and frightening, but a man all the same. Gone are the superpowers and the indomitable mystique. And without those one could almost imagine how it might be fun for a man who’s spent his entire life grappling to take him on, that it could be a fair fight Give Jones back that magic, however, and you’ll see just how fast all those brave souls scatter and marvel at how quickly all those callouts turn once again to silence.